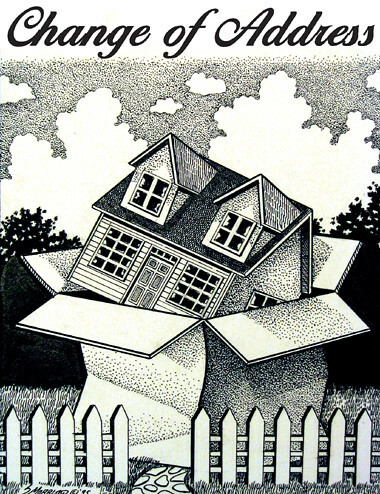 This is a pen and ink illo I did many years ago for a series of change of address cards. wow...amazing work with pen. great job. Great idea, perfect change of address. This is really cool. Great skill. This is a nice grasp on the theme. Good work with pen. Were these a change of address card that you sent to people to say you were moving or was it an actual range of cards to sell ? Nice work either way ! Andrew - yeah I created a line of them. The idea was to sell packs of the cards with realtor's contact info on the back. The realtors could then hand them out as gifts to the new home buyer. Basically a promo gift. Nice inkwork Sammo! I bet you had a few fineliner's with the noses missing after doing these, love the moving address one!